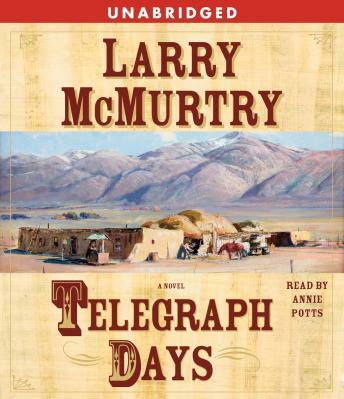 Nobody writes better about the West than Larry McMurtry, and in Telegraph Days he offers the big novel of Western gunfighters that people have been hoping for years he would write. When Nellie Courtright and her brother Jackson are unexpectedly orphaned by their father's suicide, they make their way to the nearby town of Rita Blanca. Once there, Jackson manages to secure a job as a sheriff's deputy, while the ever resourceful Nellie becomes the town's telegrapher. Together, they inadvertently put Rita Blanca on the map when young Jackson succeeds in shooting down all six of the ferocious Yazee brothers in a gunfight that brings him lifelong fame but which he can never repeat because his success came purely out of luck. Nellie almost conquers the heart of Buffalo Bill, the man she will love most in her long life, and goes to meet, and witness the exploits of Billy the Kid, the Earp brothers, and Doc Holliday. I've read/listened to several Larry McMurtry books and I guess nothing is going to measure up to Lonesome Dove. In spite of that, this one was not too bad. Its a fictional autobiography by a very unsual woman who seemed to be a partcipant or eyewitness to many of the significant events of the old west. As usual, the author gives us a very stark and unromantic slice of the old west. Different, but worth a read (or listen). I don't read many westerns, but the story line was interesting. Who hasn't hear of some of the famous characters in this book? And who could not love hearing Annie Potts. Mr. McMurtry was so fortunate to have her narrate this book. She was fabulous, great character representation. McMurtry should have hung it up with Lonesome Dove - a real masterpiece. Anything else since then pales by comparison. I listened to the first disk and then sent it back - the writing is junvinale at best and not at all entertaining. Story structure doesn't make a lot of sense and is a light year from reality.